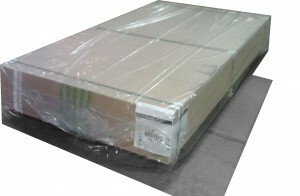 Flexpak produces standard plywood covers for the clean and protective shipment of plywood. The plywood covers at Flexpak are sewn woven material designed to give a pallet of plywood a form fit packaging solution in the post-production environment. Flexpak has the ability to adjust sizing requirements to create a custom cover for a pallet of plywood. The most common adjustments will be in the height of the package design. 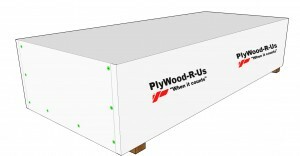 It is possible for a “top-cap” to be produced for plywood and similar products, which is a cover protecting the top of a pallet, and this can be addressed when communicating with the sales department at Flexpak. Plywood sewn covers are often used instead of lumber wrap mainly due to the fastening difficulties related to rolled wrap when attached on the end of a finished pallet. The plywood covers are folded and palletized which allows a finished plywood production line to easily select and apply a form fit cover quickly and efficiently. Strapping and staples can be used for fastening the cover, though the form fit design allows for less fastening than standard lumber wrap. Staple tabs are an excellent choice for providing extra strength in the fastening process when using staples. Plywood covers have the same capabilities for printing as both lumber covers and lumber wrap. A custom print can be established to give a strong representation of the customer’s image along with the specific type of product being packaged. See the Printing page for more information on custom printing options for plywood covers. Plywood covers can also be produced with a clear end panel. This allows the type of plywood to be examined from outside of the package before the cover is removed. Clear end panels also allow for barcode scanning for inventory tracking. Please feel free to contact Flexpak at any point to request more information on plywood wrap or custom packaging solutions. Custom plywood covers can also be manufactured at Flexpak. If the height of plywood needs to be taller or shorter for your packaging requirements, a custom cover can be made with very little change in price.